Recently, an article of mine published in Computers in Human Behavior struck a chord with the popular media. The manuscript is about the psychology of watching cat videos–who watches them, why, and to what effects. I also tested a moderated-mediation model of the interplay between procrastination, feelings of both guilt and happiness, and their consequences for media enjoyment. 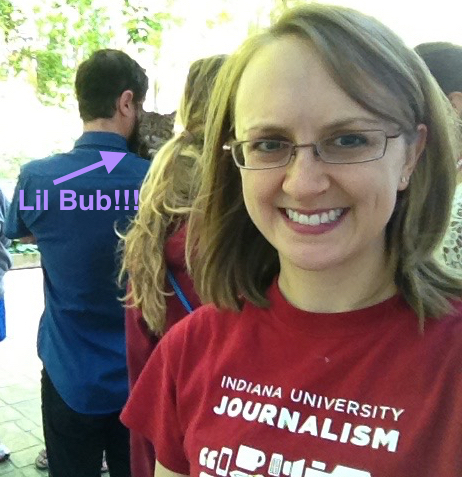 Hanging out with (ok, creeping behind…) Lil Bub in Bloomington, Ind. The finding that really caught the media’s attention, though, was that respondents reported feeling more positive emotions and more energy after watching cat videos. Cat video watchers also reported feeling less anxious, annoyed, guilty, sad, and depleted after watching cat videos. Basically, I gave a lot of people an excuse to stop working and pull up YouTube. I really enjoy investigating the impact of big-news, timely media events, like celebrity health issues or Shark Week, on media consumers’ thoughts, feelings, and behaviors. However, I think it’s also crucial to study the daily, seemingly mundane ways in which the media shape our lives. Cat videos are an undeniable part of any Internet user’s media experience, ones that can impact our moods and how we approach subsequent tasks. It was a great experience to talk with reporters from across the world about media effects research. But this survey was really exploratory and not meant to be the final word on cat-video-watching effects. I can’t wait to run some experiments to find out a bit more about the causal mechanisms of these potential effects on cat video viewers. Of all the questions reporters asked me, the most common was probably “What’s your favorite cat video?” I honestly didn’t have one before this study hit the wires, although I can without a doubt say that Lil Bub is my fav celebrity cat. I probably didn’t have a favorite cat video before this because my Internet (and real life) pet of choice is definitely the humble pug dog. I’m still not 100% certain as to which cat video is the best ever, but here are a few contenders. Enjoy!